Christmas is great—in fact, it's better than all the commercial hype! In the midst of the gift-buying, make-everybody-happy, food-gorging craziness that is Christmas, Matt Chandler helps us stop… breathe… and refocus our hearts. In this personal, warm and compelling book, we see how the God of the Bible offers what we really crave—joy and peace—at Christmas, all year round, and into eternity! Perfect to give away to non-believing friends and family or at Christmas services and other evangelistic events. There's a video of Matt's testimony available to download in the 'extras' section below. It's very powerful and could be useful to show in Christmas services to encourage people to look into the meaning of the very first Christmas. Matching customised flyers are available. Email your service details to overprinting@thegoodbook.co.uk (min order 500). 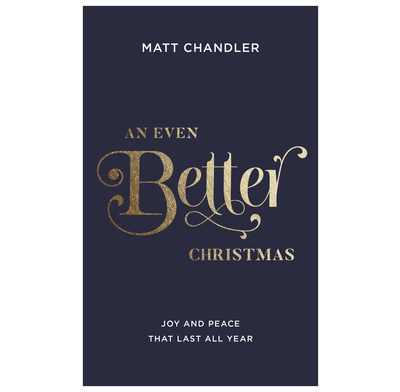 In An Even Better Christmas, Matt Chandler asks a life-changing question: in the Christmas story, are we less like the wise men and more like the religious leaders, who knew about God’s King but didn’t want to know him? Once that question is in your mind, your Christmases will never be the same again. I’m so grateful to Matt for raising it, and it has made me much more excited about Christmas this year. At Christmas we celebrate God's intervention in world history. The shepherds and wise men were smart enough to check it out. Matt Chandler, who faced a head-on collision with life-threatening cancer, is so glad that he checked it out. Let me encourage you to read Matt's amazing story and check out the Christ of Christmas for yourself. God wants to intervene in your life too. It's no secret that Matt Chandler is a gifted communicator of the gospel. But he's much more than that. He's a pastor whose heart for the lost and for the church is evident at every turn. I thank God for Matt's voice of clarity and conviction, and pray his words and witness continue to bear much fruit.